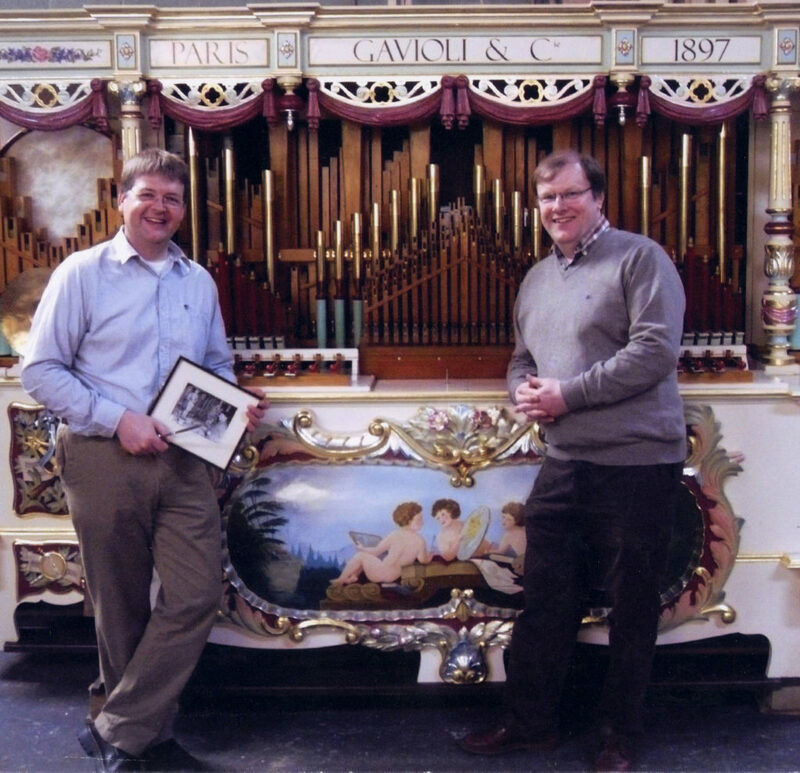 Andrew Pilmer (right) became interested in mechanical organs as a boy, seeing and hearing them in play at local steam engine rallies and other events. This interest later broadened to include player pianos, orchestrions and other mechanical instruments. He began making player piano rolls whilst still at school, cutting the holes out by hand with a razor blade. 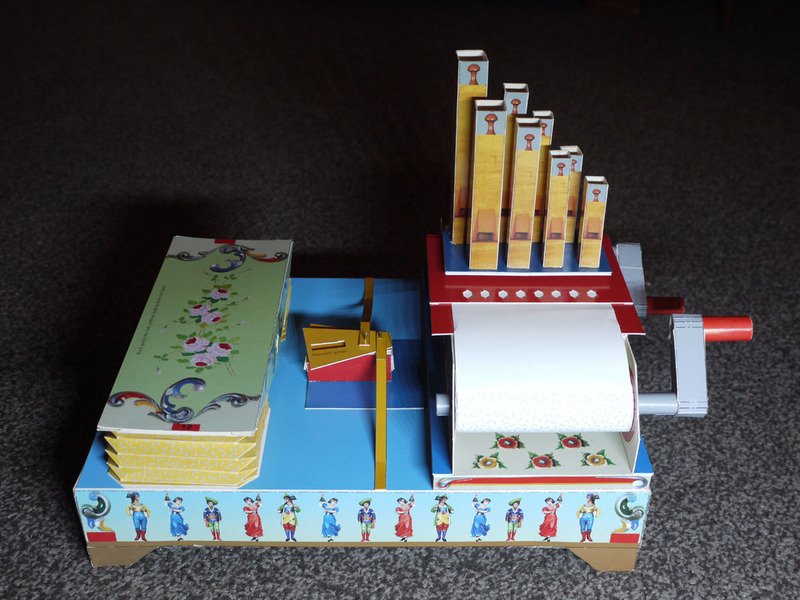 He later made his first attempts at making cardboard organ books, punching out the holes using a converted sewing machine. 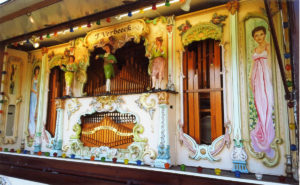 Soon after leaving school he began a small business, initially repairing player pianos, but as demand rapidly increased, his father Tony also came on board, and their first large fair organ job was completed in 1986. Soon after, the firm became a limited company. Andrew is a member of the Institute of British Organ Building, the Fair Organ Preservation Society (since 1967 and was at one time the Editor of its journal), the Musical Box Society International, the Carousel Organ Association of America, the Cinema Organ Society, the Theatre Organ Club, the Kring van Draaiorgelvrienden (Netherlands) and MechaMusica (Belgium). He has contributed articles for all of these organisations. In 2016 Andrew is proud to celebrate 40 years continuous trading in the organ business. Russell Wattam (left) joined the firm in 1987, having been fascinated by mechanical music for a number of years. An active interest in the numerous traditional crafts and tools necessary for this work, as well as the theoretical and historical aspects, has enabled his skills to encompass all aspects of mechanical musical instrument work. He also considers an appreciation of the external and social influences on mechanical music and organs to be an important factor in restoration work. His other interests include music, local history, photography, the works and times of Charles Dickens and studying the German language. He collects books on a number of subjects and carries out research relating to organs and organ builders. 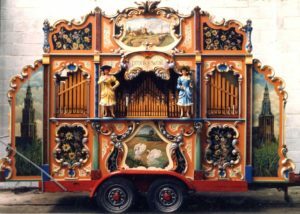 Russell is a member of the Institute of British Organ Building, the Musical Box Society International, the Kring van Draaiorgelvrienden and is Archive Co-ordinator for the Fair Organ Preservation Society.